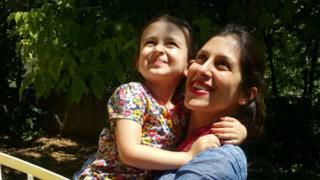 A British-Iranian woman jailed in Iran has been taken to a prison clinic after passing out, her husband has said. Richard Ratcliffe said his wife had suffered several panic attacks and low blood pressure, adding the family were "very, very worried". Nazanin Zaghari-Ratcliffe had just returned to prison after being granted a three-day release over the weekend. She was jailed for five years in 2016 after being convicted of spying, which she denies. Last week Ms Zaghari-Ratcliffe was reunited with her family, including her four-year-old daughter Gabriella, during the temporary release. But she voluntarily returned to prison on Sunday night "with her head held high", after being told her application for an extension had been denied. What is Iran jail case about? Mr Ratcliffe said his wife had suffered several panic attacks on Tuesday and Wednesday, speaking of headaches, a rash and numbness in her legs and right arm. "I think it feels like the physical symptoms of crushing disappointment since she went back into prison," he said. Mr Ratcliffe said the head of the prison had been "worried enough to come down and see her", and was "very surprised" that she had not been allowed to extend her furlough. He added she was still in the clinic as far as he knew, despite reports that she had been taken to an external hospital. A picture of Ms Zaghari-Ratcliffe saying goodbye to her daughter was posted on the Free Nazanin campaign's Twitter account on Sunday. Mr Ratcliffe said he had later spoken to his wife on the phone and she was "devastated". "It was amongst the hardest phone calls I've had with her," he added. He said the past few days had been a "whirlwind" and he was "very worried" about his wife. He added he was waiting by the phone and the family had been in touch with the British Embassy. Ms Zaghari-Ratcliffe has experienced a number of panic attacks during her imprisonment, but her husband said they were becoming more frequent. Her psychiatrist has said she needs to see a neurologist, but this has not yet happened. Ms Zaghari-Ratcliffe, from Hampstead, north London, was detained at Tehran airport in 2016 after visiting her family on holiday. The British-Iranian mother, who works for the Thomson Reuters Foundation, has always insisted the visit was to introduce her daughter Gabriella to relatives. Following the news of her ill health on Wednesday, Foreign Secretary Jeremy Hunt said "all our thoughts and prayers" were with Ms Zaghari-Ratcliffe and her family. He tweeted: "Unbearable suffering to be apart from [her] daughter with her hopes raised then dashed. We must redouble efforts to find a way to get her home." Nazanin Zaghari-Ratcliffe: What is Iran jail case about?